Being a Chelsea Supporter, I will try my best not to be bias, in this piece. At least for the sake of this piece. This year Final will be at Allianz Arena which is the home of Bayern Munich. One would expect the Bavarians fans to come out en-masse to cheer their team to victory. Playing at home for Bayern will do them a lot of good, and they have a very good record at home. This is Bayern’s only chance of silverware this season after finishing runner up to Borussia Dortmund in the Bundesliga and DFB Pokal Cup. Bayern have failed to win the league title for the second year in a row, and they also lost their first DFB Pokal Cup Final of the Century. So expect it to be very tough, because for Bayern it is their only chance of winning a silverware this season and for Chelsea it will be “double wahala”. If they fail to win in Munich, they will not be in the Champions league for the 1st time, since Roman Abramovich took over from ken Bates in June, 2003. MARIO GOMEZ - The German striker has been the Bavarian’s top scorer for the last two season, winning the top scorer award in the Bundlesliga in the 2010/2011 season and finishing runner up to Klass-Jan Huntelaar in the 2011/2012 season. He has scored 12 goals in this season Champions League only second to genius Lionel mess I who has scored 14 goals. He has also scored 80 goals in 90 appearances for club and country in the past few season. ARJEN ROBBEN – The Dutch man have had a topsy –turvy season. . At a point in the season he was out injured and when he recovered from the injury it took him a while to be on top of his game, and drawing criticism from Bayern Legend Franz Beckenbauer. He had a bad game to remember against Dortmund when he lost a penalty and also miss an open net. on his own day expect him to give Ashley Cole a run for his money on the right flank. FRANK RIBERY – The French international has been one of the most consistent player for the Bavaria giants. Bayern will be banking on home advantage, to win their fifth Champions league. Bayern weakness lie in their inability to hold their own against team with skillful and faster players which was evident in all the game they played against Dortmund this season just recently in the DFB Pokal Cup Final. Chelsea have had a Topsy-Turvy season so far in the EPL finishing sixth as well as losing to the likes of QPR and west brom but it has been a different case entirely in Cup competitions, winning the FA cup against Liverpool and against all odds beating Semi Final. I think Chelsea have had their own share of Champions League heart break, and it is probably going to be the last match for the likes of Didier Drogba, Florent Malouda Jose Bosigwa, Etc. Expect the game to be very tough. Chelsea will be missing four key players in John Terry, Branislav Ivanovic, raul Meireles and Ramires. Ramires will be sorely miss because of his speed, strength and ability to score crucial goals. 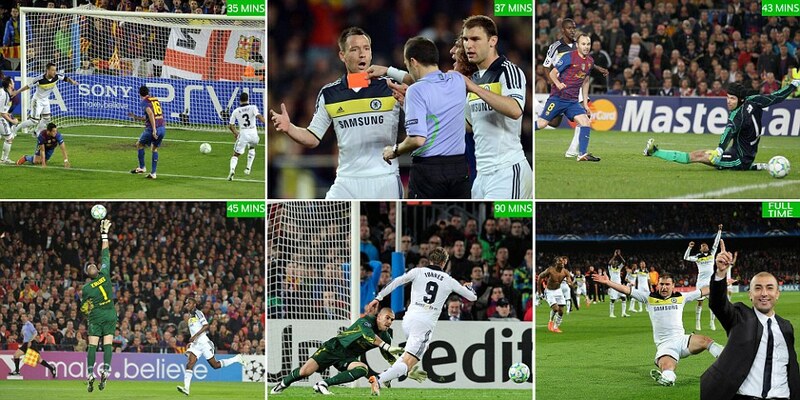 As for John Terry, permit me to go philosophical now because the last time Chelsea played in the UEFA Champions League Final, he was the reason why they didn’t win against Man United, slipping at the most important moment of his career and Chelsea History, to lose the penalty that ensure Chelsea did not win the trophy at the first time of asking. Branislav Ivanovic will be badly miss in the game because whoever comes in will not be able to cope with Franck Ribery. And for the centre back, Gary Cahill should be able to cope with Mario Gomez. For the left hand side of Chelsea defense, Ashley Cole with the experience garnered over the past few years, (winning the FA Cup seven times) and playing against the best of wingers that the world of football have ever had namely – Cristiano Ronaldo, Loinel Messi Luis Figo and so on. He should be able to handle the threat of Arjen Robben, if not subdue. DIDIER DROGBA – The Ivory Coast captain has scored 5 goals in six champions league start with his aerial threat expect him to be a tough nut to crack for the makes Bayern defence. FRANK LAMPARD – The captain on the night has been on an impressive form of late notching up vital assists in the last few games against Liverpool in the FA Cup final, and most notably against Barcelona in the both legs with his ability to score goals expect him to play a big role on the night. Expect it to be a nitty gritty battle in the midfield when the likes of Mikel Lampard, Slug it out with German machine in Bayern mieldfield. Bastian Schweinsteiger, Toni Kross, Thomas Mueller. Mikel will sit back and try to contain the likes of Toni Kross, Schweinsteiger, while Lampard will have the access to roam forward and at the same time drops back to help the defense. I think Bayern will most likely win the battle in the midfield. Chelsea Major problem this season have been their Inability to win games in which they went behind which was evident against QPR, west brom. Liverpool and most recently against Newcastle that is not good enough for a Champions league Finalist. I think one of their strength is their ability to shut out teams that play “Tiki Taka” (Tip Tap) football which was evident against Barcelona in both legs, Against Arsenal in the 2nd leg and if they can succeed in doing just that against Bayern Munich, they will be crown European Champion. To qualify for the final. The Bavarians enter into this year Champion League via play – off after finishing 3rd in the Bundesliga and beating FC Zurich of Switzerland to enter into the competition group stage. Bayern won 3 – 1 on penalties. MATCH VERDICT – Expect it to be a very tough game with both team being cautious for the first 15mins of the game expect Bayern to dictate the pace of the game for the 1st 15mins. 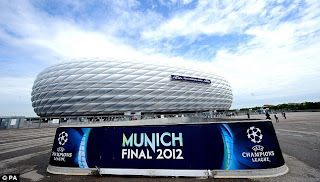 Expect Chelsea to study Bayern Munich approach in the 1st 20mins. Expect the battle to be won in the midfield. I can see Chelsea winning and eventually they will be crown European Champion. Am a Chelsea fan so pardon me. No beef intended sha o.